A Google spokeswoman did not immediately comment on Wednesday. Google said in documents filed with the FCC that the effort emerged from the work of Google’s Advanced Technology and Projects group that focuses on development of mobile technologies. Google says the sensor can allow users to press an invisible button between the thumb and index fingers or a virtual dial that turns by rubbing a thumb against the index finger. In a video on its website, Google said a user could operate a smart watch, scroll through music or adjust the volume by simply motioning using the system. 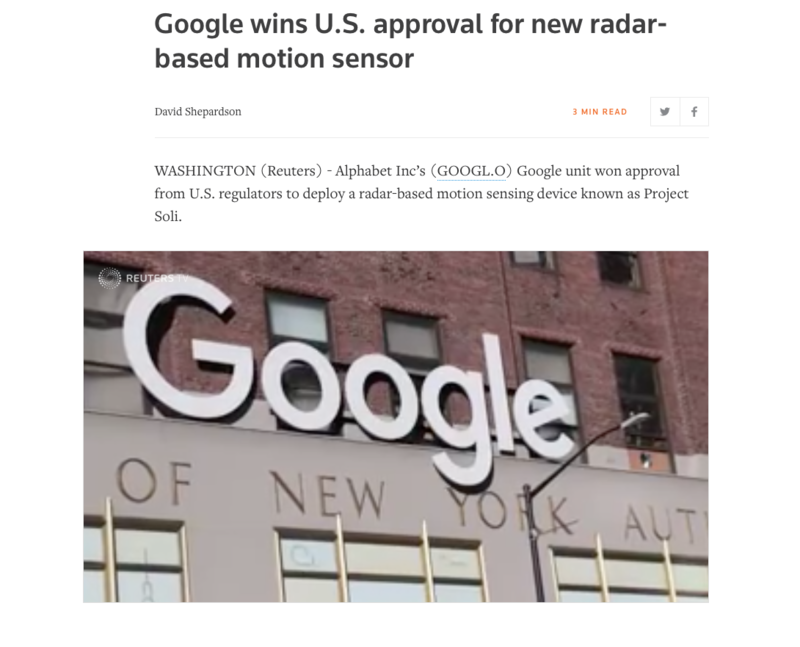 Google added that the radar signal could penetrate fabrics, enabling controls that could work in a pocket or a backpack. Facebook Inc (FB.O) raised concerns with the FCC that the Soli sensors operating in the spectrum band at higher power levels might have issues coexisting with other technologies. The company told the FCC that without the higher power levels that field testing showed blind spots could occur close to the sensor location.